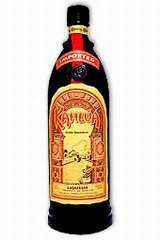 Kahlua is a famous American coffee liqueur. It is heavy and sweet, with a very distinct taste of Mexican coffee, which gives it a dark brown colour. It has been produced by Allied Domecq which was acquired in 2005 by Pernod Ricard. Combine all ingredients in a blender, add ice and blend until smooth. Try it with Stoli® Vanil, or Stoli® Razberi, or Malibu® Rum. Try it with Stoli® Vanil or Stoli® Razberi.